....no, that is not a typo...that is how "cornbread" is pronounced in parts of the south and up in the hills...so to speak. 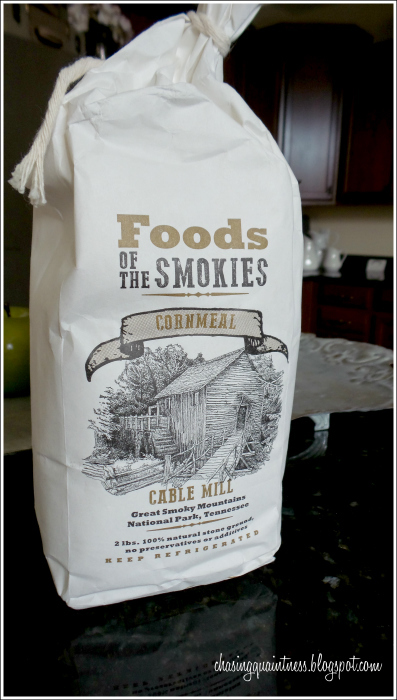 While we were visiting Pigeon Forge, TN a few weeks ago, we visited Cades Cove in the Smoky Mountain National Park, where I purchased some stone-ground cornmeal. 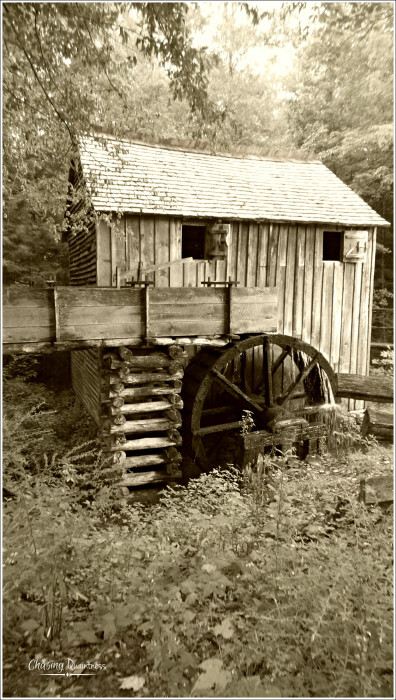 They grind the "cawn" right in this little mill. Well, this post isn't about moonshine, but it is about the cornbread we made with that wonderful cornmeal we purchased. Rather than making Grandmother Ruby's cornbread recipe, we decided to follow the recipe they gave us when we purchased the cornmeal. Beat the first five ingredients together. Stir in cornmeal and flour. Add melted butter. Mix. Pour batter into greased 8" square pan. Bake at 425 degrees for 30 minutes or until golden brown. 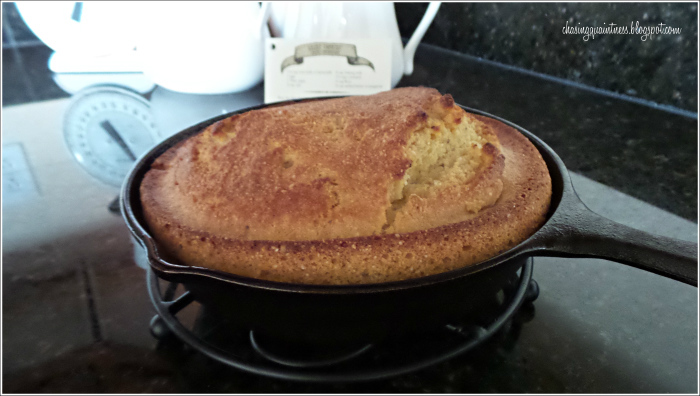 We used the iron skillet, because that is what the hubster likes to use for cornbread. I have an aversion to iron skillets, so I let him prepare this recipe. Look at how beautiful the color is on this cornbread! It is wonderfully light, fluffy and crumbly....just the right amount of crumbly. And it tastes wonderful! It has a subtle sweet flavor, but not too sweet. And it "weren't yeller", said the hubster. Obviously, we have bizarre conversations with bizarre accents around our home. I do have one other recipe to share, but I will not make it....you will just have to give it a go yourself. Bring 1 quart water to boil. Slowly stir in the cornmeal. Cook until thickened. Add butter and salt. Stir. Add sugar or molasses to taste. Hope you enjoyed this little bit of Smoky Mountain flavor! Love it! I have never heard your voice, but for some reason I can imagine to saying cawnbread, lol! I just made cornbread muffins on Saturday. I add a bit of sugar to mine for a little sweetness. Was the mix finely ground or slightly course? Sounds like fun times!! I prefer a little course cawnbread but the hubs doesn't. The kids don't care either way. I love a good cawnbread! I have never made it in a cast iron skillet....your hubby may have somethin' there! :-)...I do too AnnMarie. I let the hubster handle the skillet because I burn everything in them. But that skillet does make better cornbread than my regular baking pan does. Ohhhhh sighhhhh... That looks simply delish. And beautiful even. In that iron pan, especially. Thank you ma'am....just don't wet the cawnbread....LOL Hugs!! YUMMY! We love cawnbread too. :-) It is just one of those wonderful "feel good" foods! LOVE cornbread......this looks delicious and I agree with your hubs that the iron skillet is the way to go. I don't think I have an accent but everyone else does LOL! I think I am hiding it but guess not. my texas daddy's favorite snack was cawnbread in a glass of buttermilk! he told my yankee mother to NEVER put sugar in his cornbread again. she did. that one time only. LOLOL. i had the neatest little cast iron skillet like that... perfectly seasoned. but I broke my wrist. and it just got too heavy to wield around for me... so i let it go to a new home. but it did make perfect cawnbread! and i love dialects! ALL dialects... not just southern. totally fun. and fascinating! I lost my y'all ages ago. kids can be cruel! LOLOL. 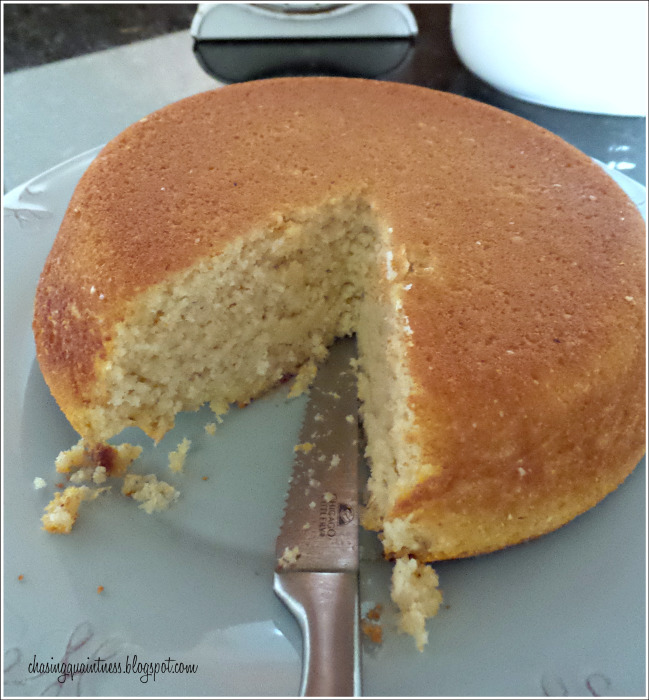 I love cornbread and my grandmother makes it this way too! We could truly eat it every day! And I do think the iron skillet makes a huge difference in the taste! Your 'cawnbread' looks amazing, Benita! So light and fluffy! I was just going to say I'll take a huge slice with a tall ice cold glass of milk, thank you very much! ;). I don't mind the milk or buttermilk, but one of my pet peeves is when someone puts a glass in the sink without rinsing it out! Pinned! I so can not wait to try making this! We love our 'cawnbread' with butter drowned in honey! Thank you so much! That stone ground cornmeal is wonderful and I have found that is so much better than what we buy in the store. I’ve been able to purchase stone ground meal a few times and wish I could find it on a regular basis. Thank you for helping me feel normal about the milk residue in the glass…..just rinse it and put in the dishwasher…LOL. Hugs!!! I love that stone ground meal. My grandmother made wonderful cornbread! She will meet me in Heaven with a plate in hand. Fried bacon, added some to the batter and some to grease the skillet!! Yum! Makes me want to go make some. Oh, that sounds so delicious Kay! Wow! That's a beautiful cornpone there, Benita! Coming from a farming family, my father always had cornbread and buttermilk for supper because breakfast and dinner (lunch) was huge. I'm trying to talk my husband into the idea of our main meal being at lunch when he fully retires. Leftovers for supper and no pots and pans to wash up at night. I like that idea.